Now with the Luminous Mysteries! Previously titled Art 5 for Young Catholics and used as our main Art text for grade 5 The Rosary in Art is an art appreciation book by Seton Press. This is a book written to enhance the understanding and appreciation of the Catholic principles that went into the techniques of religious art. 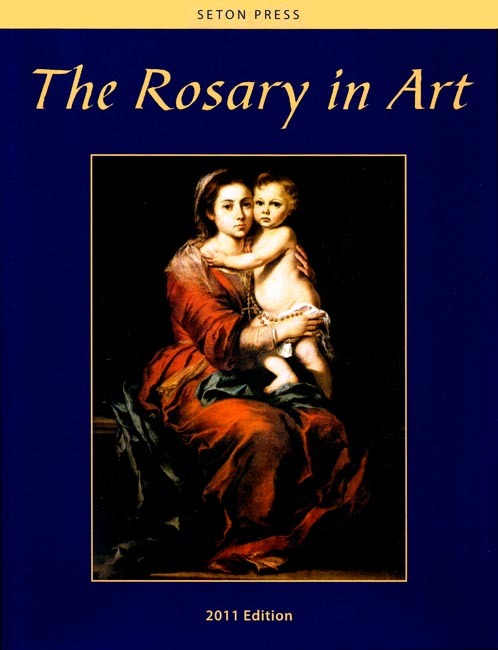 The theme of the book is the "Mysteries of the Rosary," as beautifully depicted by the world's greatest artists. In a showcase of fine art, the student will be exposed to the development of style from Greek to Baroque to Florentine, and other classical schools. Description of technique, scene, and color accompanies each picture, with a special emphasis on religious symbolism. Some contain brief yet profound meditations. A feast for the eyes and the soul! Glossy pages. Contains an appendix of short biographies about the artists, and an index of terms. This is the main 5th grade Art text used in the Seton Home Study School curriculum program. Full color. 2011 copyright. 8.5 x 11 inches. Softcover. 153 pp. Also available in Hardcover. Seton Homeschool Study did a great job putting this book together. My children and I learned so much from reading this book! I wish all of the Seton art books were like this one!